I don’t know about you but this statement is the only thing that keeps me going. As long as Satan roams this earth anything is bound to happen (1 Peter 5:8-9). I am a person who used to thrive on stability, which always lead to disaster because I put my hope in the wrong things (Psalm 118:8). God is the only thing that will last forever and keep His promises (Deuteronomy 7:9, Isaiah 40:8). Standing on his word allows me to sleep through any storm (Mark 4:35-41). God is forever (Psalm 45:6, Psalm 52:8-9)! keeps me going and keeps me looking forward to interesting surprises. Thank you Clark! God’s surprises are definitely worth waiting for! Amen!.His mercies are new every morning; the only changing part of God. That’s a beautiful doodle. I love your blog…..It is a breath of fresh air!!! This post really ministers to me. At a time where I am going through a lot of changes it’s good to reminded that God never changes!!!! 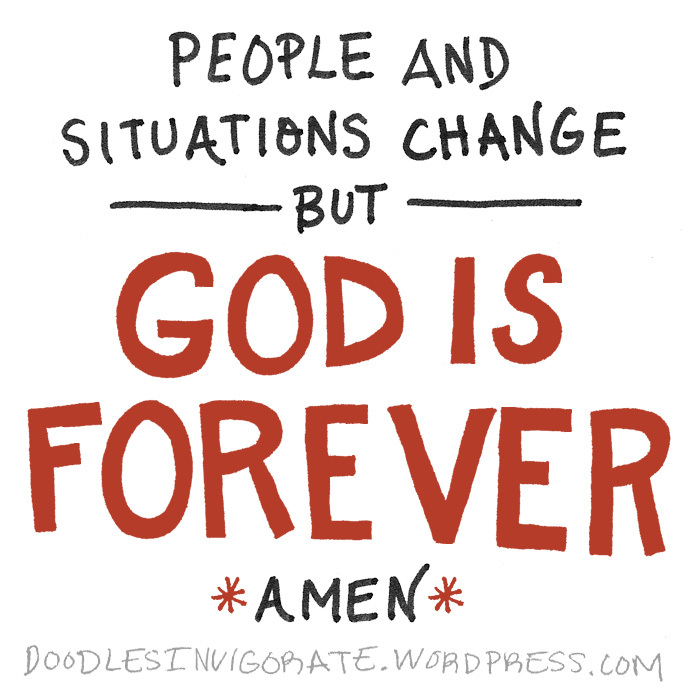 People and circumstances and everything will change but God doesn’t. Thank you. Hi Rolain. Thank you. I am glad you are encouraged! I’m so grateful we have a dependable God.